Do Not Pervert David Hogg’s Name! HEAR YE! HEAR YE! Do not slander the hogs and pigs, wherever they may be. You do that by using David Hogg’s name in vain. Do not associate him with those honorable creatures. They are in no way alike. Hogg’s last name is even spelled differently, with an extra “g” . Now let’s get this straight: DAVID HOGG WAS NOT A SHOOTING SURVIVOR! He was nowhere near the school when the staged shooting took place. Furthermore, research has shown that he never attended Marjory Stoneman Douglas High School in Parkland, metropolitan Miami, Florida, This entire thing is a lie. It was posted on Facebook that David Hogg had actually graduated more than two years ago, in 2015, from the Redondo Shores High School in Redondo, part of Greater Los Angeles, California. So he is older than he represents. He is not a teenager. Sifting through all the lies Soros put together for this deed takes time to sort out. The school principal of Redondo Shores High School verifies this and furnished copies of document proof which have been published. So I am not just an arm chair sleuth, but one with boots on the ground. We have not yet seen any certified autopsy reports from state pathologists nor obituary reports. That’s odd. *A 17-year-old student, a senior, at Marjory Stoneman Douglas High School (CNN). *The son of a FBI agent — the federal agency that is so maligned by President Trump. *He and his family moved to Florida several years ago, when he was a freshman. Hogg once wrote on Reddit about moving in the middle of his freshman year and how hard it was because so many people in high school weren’t authentic (Heavy). 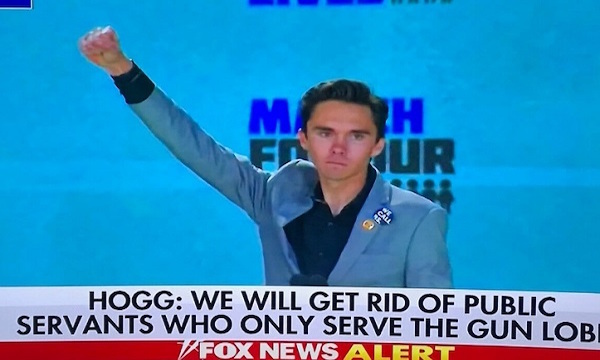 *Hogg is an aspiring broadcast journalist. He said he was in his environmental science class when he heard the first gunshots, and that they never had an active shooter drill at the school. Hogg produded a video he supposedly took while hiding in a school closet as bullets were flying about—so brave, so calm in the midst of a massacre and with the presence of mind to advocate gun control. Really? But then, there’s a video of Hogg flubbing his lines that he was being coached to deliver ‘for the party’ regarding getting all guns out of the hands of all citizens. We’ve seen that video. And here’s confirmation that David Hogg is a 2015 graduate of Redondo Shores High School. He registered as one on Classmates.com. Below is a screenshot of David Hogg’s page on Classmates.com, showing the time (11:43 am) and date (2/21/2018) when the screenshot was used. Since this all happened, this page has been removed. The page is also archived here. If David Hogg had already graduated from a California high school more than two years ago, in 2015, that means:He is not 17 years old, but is at least 19…maybe more…. He was or is not a student at Stoneman Douglas High School in Parkland, Florida. Please contact Robert Runcie, superintendent of Broward County Schools, and ask him to produce evidence that David Hogg was or is registered as a student at Stoneman Douglas High School. To send him an email, click here. David Hogg’s FBI father, Kevin, had worked for a defense contractor that specializes in simulating crisis operations with crisis actors. David’s mother, Rebecca Boldrick, is a proud supporter of abortion mill Planned Parenthood.Kevin Hogg-David Hogg’s mother Rebecca Boldrick stands with Planned Parenthood. David Hogg was recruited by George Soros as a “useful idiot” (Soros’ own description of those who sell out to him) and was groomed for over a year for this dastardly action. He was paid by Soros with assurances of an official leadership position. They next found, and paid the shooter, Nicolas Cruz who had mental problems, as most of those assassins had, as well as future ones . Mentally ill people crave to do something heroic and be praised. In this the recruited shooter is told his action will SAVE innocent children since it will result in guns taken away from all citizens so they cannot shoot anyone else. People like George Soros have no conscience or heart. And what a cruel thing Soros has done to the vulnerable mentally ill, to MISLEAD them into carrying out his dirty work. Here is what we the people must do: Without let up we must bombard our Department of Justice to charge Soros with TREASON and SEDITION. Insist that the U.S. allow Russia to bring in officials and arrest Soros since they have an international warrant for his arrest. Soros owns a lavish home on Long Island in the Hamptons, another in New York State, an apartment in New York City as well as an office there on W. 55th Street. He also has a business office in London. We must ask for world cooperation in nabbing him, the most evil man ever created. This will be challenging since George Soros owns most of the U.S. Government. Unfortunately most everyone has a price. It is amazing to this writer how cheap any man will sell out his integrity. However, we MUST contact all officials continually, insisting that the DOJ arrest and prosecute George Soros for Treason and Sedition WITHOUT LETUP until it happens. And this is why two cops and armed school security officer would not enter the building to protect kids. Soros told them to stay outside. We must also contact other officials. People, if we do not retake our country, Soros will take it from us and unto himself. And if that happens, this writer will be reminding everyone that they allowed this to happen and refused to put a stop to it when they had the chance. We’re hearing talk about activating citizen militias. Perhaps. All the problems in the world could cease to be if the Agitator in Chief were removed from society. Russia, are you listening?